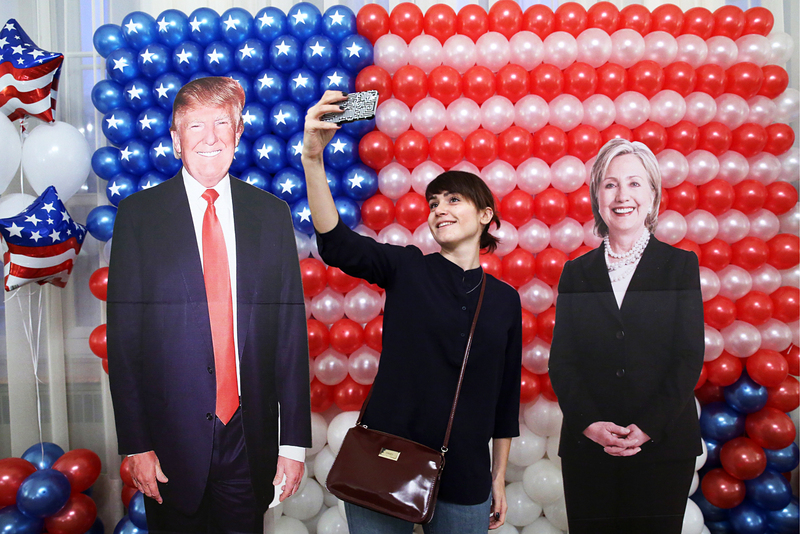 A woman takes a selfie at a reception at Spaso House, the residence of the US Ambassador to Russia, on 2016 US Presidential Election Day. Politicians and foreign policy pundits surveyed by the Russian press say that Trump won not because of his opinion about Russia but because of his anti-establishment credentials — which conversely make it harder to predict the future of U.S.-Russia relations. The end of the U.S. elections have been big news in the Russian press. Experts quoted by Russia’s major newspapers and website have offered a variety of reasons for Trump’s unexpected victory, but are reluctant to say that the change will necessarily result in an improvement in U.S.-Russian relations. “Issues such as maintaining a liberal international order, distributing democracy, restraining Russia’s power, and the view of Vladimir Putin as the focus of the world’s evil — these issues are what much of Clinton’s campaign were based on. As it turns out, this did not bother the average American voter, which is why it turned out like this,” Dmitri Suslov Deputy Director of the Center for European and International Studies at the Higher School of Economics in Moscow said in an interview with Gazeta.ru. Despite the fact that Trump was the official candidate of the Republican Party, many in the party leadership sought to distance themselves from him. Many experts think that Trump’s victory will result either in reform or a split within the GOP. Trump will likely find it difficult to work with the establishment Republicans once on the ground in Washington. He lacks large transition team that will help him with his move into the White House. And, although Trump is in relatively good health, he is still the oldest person elected U.S. president. Will relations with Russia improve? “We are still awaiting a reaction, although we don’t really even have hope that the Senate and the House of Representatives of the United States would gather together with some representatives of the four committees for foreign affairs to discuss the situation,” Slutsky said. Vyacheslav Novikov, first Deputy Chairman of the state Duma Committee for International Affairs, also said that it is unrealistic to expect swift changes after Trump’s victory. “Trump’s victory is a signal that problems in the U.S.A. have built up,” he said in an interview with Kommersant. A number of politicians expressed their frustration with the situation on Twitter, only to think better of it later. Gerard Araud, the ambassador of France to the U.S., wrote on Twitter: “After Brexit and these elections everything is possible. The world is crumbling before our eyes. My head is spinning.” This post has now been removed, however. Former U.S. Ambassador to Russia Michael McFaul wrote on his Twitter page: “Putin has interfered in our elections and succeeded. Well done.” This tweet has also since been removed. Russian Foreign Ministry Spokesperson Maria Zakharova had time to react, however. “Firstly, the Obama Administration appointed this McFaul to responsible positions and entrusted him to managing not only the affairs of his own country but those of many vassal states, and then, when this situation became unworkable he began to cry that Moscow is to blame,” she wrote on Facebook.